MIAMI (AP) — Once again, Zack Wheeler looked right at home at Marlins Park. 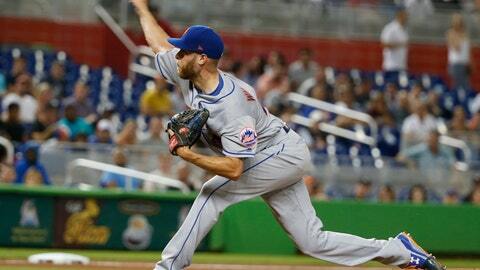 Wheeler won his fifth straight start overall, pitching seven solid innings and sending the New York Mets over the Miami Marlins 6-2 on Friday night. He is 3-0 with a 1.55 ERA in six career starts in Miami. Wheeler (7-6) allowed four hits and two runs. He struck out eight and walked just one for the fourth consecutive outing. “He kind of goes after them like he knows his stuff is better than them and he’s going to make them beat him,” Mets manager Mickey Callaway said. Wheeler’s scoreless-inning streak ended at 23 when he gave up a two-run homer to Miguel Rojas with two outs in the seventh, making it 4-2. Marlins manager Don Mattingly had a different perspective. New York’s Amed Rosario had three hits and drove in two runs to set the tone from the leadoff spot. Kevin Plawecki knocked in two and Austin Jackson had three hits for the Mets, who have won three of four. Jose Urena (3-12) gave up four runs in 5 1/3 innings as the Marlins lost for the ninth time in 10 games. The Marlins have only scored more than three runs once during that span. Miami’s Derek Dietrich played first base and batted cleanup, spots generally reserved for Justin Bour, who was traded to the Philadelphia Phillies before the game. Michael Conforto hit an RBI single in the third. The Mets opened up the game with three runs in the sixth, with Rosario having a two-run single. Plawecki added a two-run single in the eighth. Mattingly hopes the trade of Bour, who played five seasons with the Marlins and hit 83 home runs, did not affect the team. Jackson tied a season-high in hits for the third time over his last four games and has at least one RBI in five straight starts. Marlins: RHP Kyle Barraclough (back) was placed on the 10-day disabled list. … RHP Drew Rucinski (groin) was reinstated from the 10-day disabled list. Mets: RHP Corey Oswalt (1-2, 5.13 ERA) is the scheduled starter for the second game of the series on Saturday. Oswalt allowed six runs in 2 2/3 innings in his only appearance against the Marlins on June 29. Marlins: RHP Dan Straily (4-5, 4.35) will make his third start of the season against the Mets. He is 0-1 with a 2.77 ERA against the Mets this year.